Silver Spruce Resources is a very interesting company and is well worth anyones time to really go over some of the information they have on their website along with the presentations. If you are looking to get some investing dollars involved in a silver play that could have some tremendous upside, this could very well be the junior you will want to investigate and do some due diligence on. I would also like to point out that I did write up on this very same company back in November, 2015 as I am always on the prowl looking for under valued stocks with an upside potential. Silver Spruce as a company has been around since 1996 and although it's first ventures were in the exploration of uranium and rare earth minerals, it has taken on a project in the state of Chihuahua, Mexico and it's this exploration project, called the Pino de Plata Project that we will be taking a look at here. The field team successfully pinpointed the proposed drill hole locations and mapped the new road access for the upcoming maiden drill program at the project. The team also completed onsite tours with representatives of three drilling companies that are submitting bids for the drilling contract. This first ever drill program at the project is based on recommendations contained in the NI 43-101 report, which is available on our website at www.silverspruceresources.com and is filed on www.sedar.com. The Pino de Plata Project is located on the western side of Chihuahua state along the western edge of the Sierra Madre Occidental silver-gold belt. The property consists of four, road accessible concessions that cover an area of 397 hectares. The property at present has no active mines other than small scale mining which has gone on for hundreds of years dating back to the 1600's when the Jesuits first settled the area. There is however the very large Palmarego Mine owned by Coeur Mining that is located just 15 kilomters away. See map image below. It should be noted here for the sake of reference that the Palmarego Mine is the third largest silver mine in Mexico and nineth largest in the world. In 2015 this mine produced 65.1 M oz Ag and 70,922 oz Au and has proven and probable reserves of 449 M ounces Ag and 690,000 ounces Au. Old mining activity in the past did return good grades. In some cases grades as high or even higher than 1000 grams per ton silver were noted. Aside from remnants of old mines and workings, there has been no trenching or drilling on this property which in turn led to Silver Spruce doing some exploration on the property. The property was examined in 1985 by Consejo de Recursos Minerales and in 2013 and by Arcelia Gold. Both focused on existing workings and made resource estimates which could not be assessed due to unclear methodology and unsafe access to their sampling areas. Over the last thirty years, the recent owner surface mined and direct shipped high grade ores, some as high as 1000 grams per ton silver to different mills and smelters. In May of 2015 Silver Spruce produced a NI 43-101 exploration assessment report which identified a few high potential areas for exploration and drilling. Most of the sampling that Silver Spruce did was taken around older workings. These samples were later assayed and results showed very good grades. One of the areas was shown to host widespread intrusive epithermal mineralization at surface with silver values, on average greater than 1.6 ounces per tonne. Some targets within this area of more than 1 square km has assays of up to 557 g/t or 17.9 ounces per tonne. One area known as the Terrero target which is about two hectares in size and had good mineralization in igneous rocks contained good silver grades at surface. Seven out of nine samples were known to have been more than 1 opt Ag to as much as 17.9 opt Ag. Based on current geologic mapping, sampling and interpretation, the Company's modeling suggests that the Terrero target could contain 11.2 million tonnes of mineralized rock. Based on the nine samples taken from the Terrero target at surface with an average silver grade of 250 g/t (8 opt) Ag, this target represents a potential resource of up to 90 million ounces of silver alone. The company hopes to drill as many as six, 100 meter holes in this area. Additional sampling on other areas of the property have shown excellent grades as well. 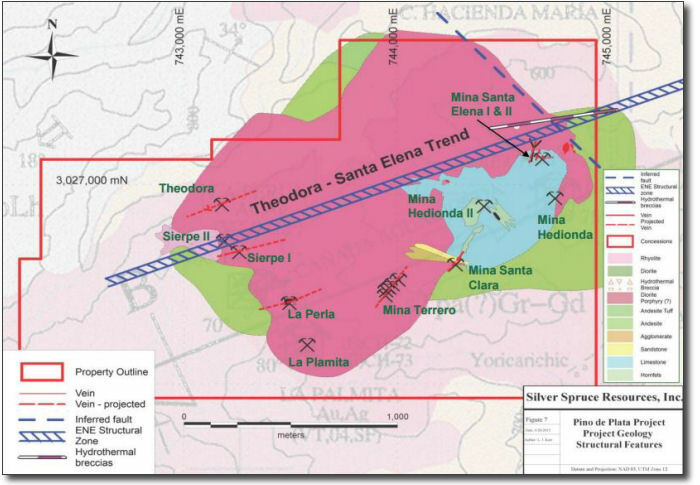 The Santa Elena area covers an area of about 20 hectares and has been modeled that it could contain as much as 1.3 million tonnes of mineralized rock with an average grading of 250 g/t (8 opt) Ag which suggests an in-situ resource of up to 10.5 million ounces of silver. The company hopes to drill as many as five holes in this area. Drilled depth would be up to 100 meters. Two other targeted areas, the Sierpe and Theodora were also looked at. 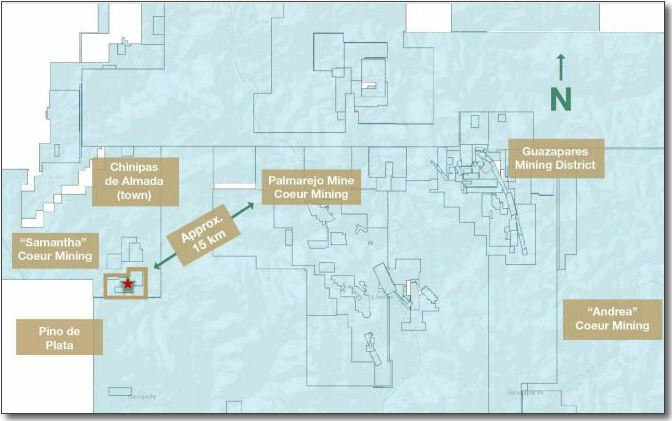 These targeted areas are vein type that were open on strike and could contain an additional 28.5 million ounces of silver. So a combined total for what has been sampled and explored so far gives an estimated potential of around 130 million ounces of silver. This however needs to be verified and once the company gets drilling they will be able to prove up the resource more in depth. As mentioned at the beginning of this article, the company is getting to drill and with the targets they have found so far it looks like this will be a very exciting play to watch. It's not everyday that we see a junior starting too drill in such a positive environment. This is one junior you will want to have on your watch list and maybe even get email updates from the company so you are up to date during the drilling of the project. On December 1st of 2016 Silver Spruce issued news stating that the company had aquired an additional property. This porperty is more gold than silver but will add considerable value to the company with an exposure to gold. The property is located close to Chinipas, in far western Chihuahua State, and consists of over 300 hectares, where field crews sampled 8.42 grams per tonne (g/t) Gold (Au), 8.04 g/t Au and 3.95 g/t Au in chip channel samples from mineralized outcrop in late September. The new property is called the Encino De Oro Property. An initial property examination in late September 2016 confirmed that an outcrop of strongly silicified rhyolite tuff contains gold grades ranging from 3.95 g/t to > 8 g/t in three samples over 3 m in width. Leonard Karr examined this outcrop on November 17, 2016 and based on strength of silicification, quartz veining and iron oxides after pyrite found the values credible. This immediately elevated the Company's confidence in the vendor's statements concerning other multigram gold assays in the area, and Silver Spruce immediately began a reconnaissance mapping and sampling program on the property. Today there are thousands of junior mining companies to invest in. With the recent rebound in metals and gold in particular, investor taste for these kinds of investments have turned positive. Prudent and contrairian investors know all to well that these kind of investments run in cycles. Knowing these cycles there is no doubt that the world has seen the bottom of the bear cycle and the time to look at investing in these types of investments is now. Investors who understand this will be active in evaluating companies and projects that have a lot of positives and this is a catagory that Silver Spruce is in. Here is some good reasons to have Silver Spruce on your investing radar.